The Color Calibration module provides a way to better align the colors within an image to that of reality. This is accomplished by including a standardized color chart within the image that can be used as a color reference. By aligning the image color chart with the known color chart the rest of the image's pixels can be moved towards the calibrated colors. Note that images that are severly out of color alignment will cause pixelated artifacts as the module tries to move pixel colors to aligned colors. It is always better to configure your hardware imaging devices to produce the best colors possible and thereafter attempt software correction. 1. Green, Cyan, Purple, Blue squares - drag the squares to align with the color chart that should be present in the image. 3. 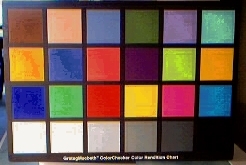 Color Samples - The Color Samples are the known colors that are used to calibrate against. 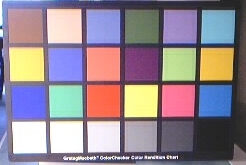 The module is configured for the Macbeth color chart by default. If you are using a different calibration chart you can press the Resample button to sample the colors from the new chart (once aligned) and then use either the edit button or double click on the color to change its value. 4. Soft vs Harsh Option - Select how strong the alignment should be. Selecting Soft will align the source image to the calibrated color with respect to intensity and contrast which will help align the colors but not radically change the image colors. 5. Sample Size - Specify the size of the sample area. The sample area should include only those pixels that specify a specific color and are average to produce the alignment color. If the sample size is too large then non-color chart colors may influence the calibration so be sure the squares fit in the chart area correctly. 6. Horizontal & Vertical Samples - Specify the appropriate number of samples that your color chart contains by adjusting the horizontal and vertical sample number. Note that when adjusting these values the number of squares and sample colors will change to reflect the new dimensions.